[CryptoCurrency MASTERNODES] 100% Passive INCOME .2019 UPDATED V3.0 .Closing Soon! I am still accepting new clients, but i will only allow to JOIN 2-3 persons as I am working on other projects, so I won't be able to serve more people. So if you interested to join and start making passive income like other customers, JOIN and don't miss this opportunity. So it's your last chance to get involved and get accepted into vip masternode group. Not sure yet, but I am thinking to accept only 2-3 more people and later close this offer/thread and concentrate on my current customers and new trading project. People who planning to invest more than $2,000, don't need to pay entry fee which is $197 and also they will get access to my trading project where I wil share and help people to trade and gain even 500% monthly ROI. So be fast and do not miss this opportunity. Hey, sent you and email, please reply when you can. Thank you. One more person JOINED. So this will be open for 1-2 more people and this offer will be closed. Hurry up guys if you don't want to miss this opportunity. I am preparing some amazing stuff inside the group with more making money opportunities which will blow your mind. All new customers will get a chance to participate in my NEW Trading crypto project where you could easily earn up to 50% monthly ROI without lifting a finger. $6000 Investment would bring you $100/daily with this Crypto Trading ProjectX !!! Last edited on 6th Feb 2019 at 02:12 AM. to make this worthwhile we must put in huge amount of money otherwise its not worth it. At the current market conditions I suggest to put at least $2000, otherwise as you said, it's not worth to put lower amount. But on the other hand, what you put now, after crypto market recovers, can be worth 10x or even 100x. they keep saying the market will change and become bullish but what if it never happens? they have been saying this since last year and still not happening and its getting worse and worse. I am a full time trader so we(traders) don't need anyone to tell that market will recover, we simply see this in chart's, in previous year chart's and so on. But there are two types of people, one type is who don't believe in cryptos and another type of people who believe in cryptos.Personally I am 100% sure, market will recover and I am happy and excited that the prices dropping more and more. Some currency/projects will fail/die, some currency will boom, but whole crypto market/blockchain won't die, never. Just imagine this, long time ago, btc price was let's say $1, now the price is $3400, you still think something is wrong and btc will die? In my opinion everything is fine, corrections must happen, everybody worrying about the crypto because the correction was huge, from $20k to $3k, but I don't think that 2017 all time high was natural and media made such big btc price. So overall, I am 100% sure, crypto marke will recover and I just suggest to people who don't believe in cryptos to stay away from it. Contact me and I will explain what is new in this updated version, why it's better than old version and all other info about how you can make killing in 2019 years! 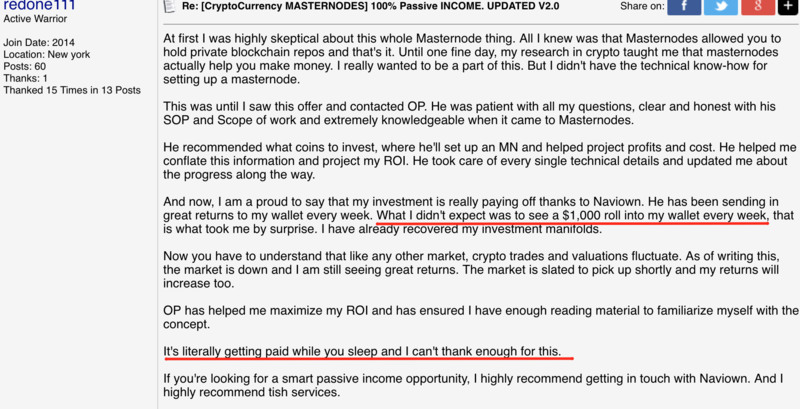 Re: [CryptoCurrency MASTERNODES] 100% Passive INCOME .2019 UPDATED V3.0 .Closing Soon! Interested mate, please PM me full details of the new updates and current price. As some of you know, I am full time crypto trader, consistently learning more and more TA (technical analysis), getting more and more exprience in reading charts and learning price movements. I am a member of many high priced crypto groups where I am getting information about crypto from other professional traders, getting info which don't get other people. So this is why I am thinking that BTC price soon will reach the bottom. What does it mean? It means, that after the bottom is reached, whole crypto market will start recovering and prices of all coins start rising. It's just my opinion. So this is why it's a perfect time to start buying the coins which prices are heavily down and are highly undervalued. These coins can make money not only as an investment and just holding for the price to increase, but also because these coins can be used for building masternodes and each day would generate more coins. I have about 20 customers and not even single unhappy person! Some earning $20 weekly, some earning $100 weekly, some earning $1000 weekly. It depends how much you are investing into the coins. And the best part is that all these earnings can increase 1x-10x! If you don't want to miss the train and if you want to make 100% passive income by owning masternodes, hit me up, I will answer all the questions, explain how everything works. As I am accepting only 1-2 more people, I am looking for customers who can invest at least $2000. The entry fee is waved. I'm dropping in to say a few words about Naviown and this WSO. I approach things cautiously lately -- there's just so many things to watch out for. So far, he's done absolutely everything he has said he would do, and the money gets paid regularly. For now, I've chosen to keep re-investing all profits, and they're growing at a steadily-rising rate. Not getting rich, but getting paid regularly. The opportunity is real and can be independently researched. Also, he's quite knowledgeable and truly (it sure seems) not just out to 'sell' you something. If you get involved, you get involved -- he seems genuinely interested and happy to help. If there's a 'caution' at all here. it's this: he is, understandably, a very busy person. It seems he's the only 'office staff' he has as well, but he's still been very accessible and up-front about his promises and schedule ("Busy day today -- will get you that report later" or "tomorrow". And then? He actually DOES it either via the private Discord system or Skype -- all good and with zero trouble). All is well here -- the market is down but better this week (so far) than last, and this is truly the most 'passive' thing I've done to make money...EVER! Don't ever invest money you can't afford to lose -- that should always go without saying, no matter where you put your money. But this man has a track record that is golden so far -- no beats missed and looking better all the time. Thanks, Naviown -- I appreciate the opportunity you allow us and for your knowledge and follow-through. Great job, and I look forward to many happy returns. 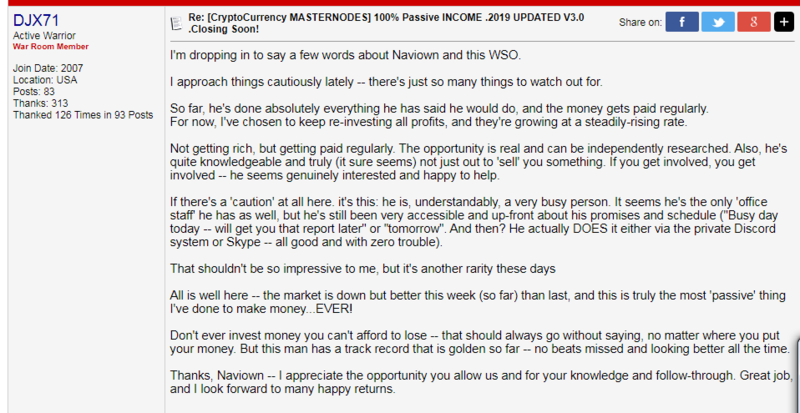 I am receiving PM's and emails from people which is really cool and thanks for the interest, but please contact me only if you can invest at least $2000 into masternodes and my service. How much I can earn daily if I invest $1000? At the current market conditions the ROI is about 6 months. So if you invest $1000, you would earn about $150/months, which is $3/day. Keep in mind that whole crypto market is down and in bullish market prices should recover so profits would be much bigger. yeah. Unfortunately the risk:reward ratio is very bad. I recently bought a bot to participate in pump and dump signals. I think the risk:reward ratio is better doing the pump and dumps. On my side everything running very smoothly. All payout's are beying made and all customers making profits. Still looking for few guys to JOIN our team. Don't miss it as I can't accept many people, just few are able to join. Also, I have other WSO's/offers with another good passive income opportunities, check them too. Thanks and happy Valentines day! Market shows recovering signs, ethereum price bumped and we are thinking that soon it will reach $200. A whole crypto market is still a bit bearish, but slowly more and more bullish signs showing, it means, that very soon btc price will start increasing and will reach high levels again. Join masternodes NOW if you don't want to miss this opportunity, prices of masternode coins are still very cheap so it's a good opportunity to get them cheaply and later receive big returns after market recovers. Still looking for 1-2 more customer! It looks like crypto bear market will end very soon and after the market start recovering, all other crypto coins recovers too, it means that you won't be able to buy masternode coins cheaply and the best time to buy them is NOW. Still looking for few guys to join my masternode CLUB and make massive profits! Still accepting customers. Masternode coins started to recover so it's good time to invest into these coins and start getting rewards from masternodes. Hit me up and let's move forward.